Holyoke Baseball Club, 1878. C. Farrington, Manager, William Sullivan, Center Field, J.T. Lynch, Left Field, J. Lynch, Right Field, D. O'Neil, Short Stop, P. Moore, Substitute, E. Whiting, Manager, F. Snyder, Third Base, J. Driscol, Pitcher, R. Winchester, Second Base and Captain, J. Bergh, Center, T> Donovan, First Base. 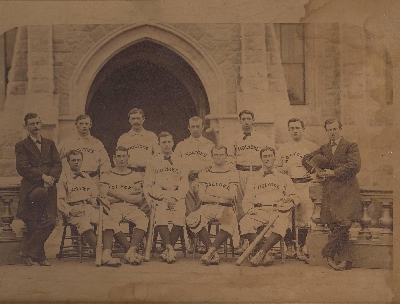 "Holyoke Baseball Club," in Creating Holyoke, Item #351, http://www.creatingholyoke.org/items/show/351 (accessed April 23, 2019).